This (cleaned up!) thread is for all things force fed on the VR6 motor. Here's the basic VF Stage 2 kit fitment guide I did some time ago, which may still be useful to some folks. 2) Punch and tap it then fit return union. Reason being, loads of [email protected] gets in there as you can see in the pics. Better to be safe than sorry. 3) Remove old sump and fit new one. Nip bolts up to 18lb/ft with a new gasket. 5) Undo front engine mount top nut and jack engine up and remove alternator support bolts. 6) Fit idler pulley with supplied bolts into the holes where you removed the standard bolts. Spacing may be required as per pics. 7) Fit charger and 6 ribbed belt with supplied bolts. Second person maybe required to assist with fitting of the inlet pipe, which needs to be done at the same time. 8 ) Tension belt so that you get 30 degrees reflection between charger and idler pulley. 9) Fit Oil supply and return hoses. 10) Fit MAF clamp as per pic. Red and black wires to +12V and Ground, Blue wire with red stripe to MAF signal wire (red) on the VW loom, and plain blue wire goes to the red wire 'from' the MAF. So it's working in series intercepting the signal, if you see what I mean? For a switched live, I tapped into the wiper power supply which keeps the loom short and earthed to the ABS sensor bracket. 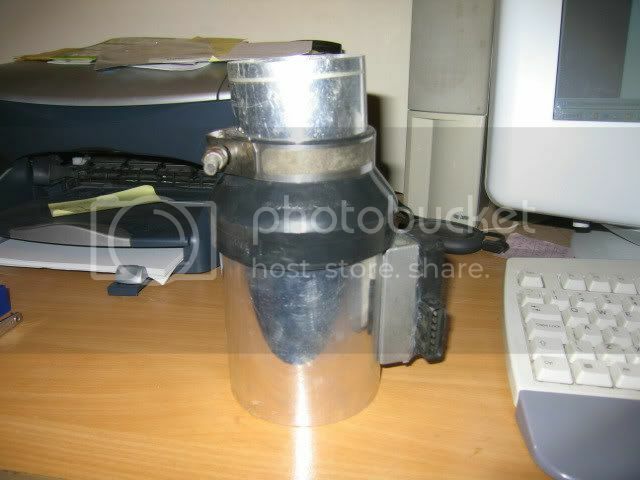 11) Fit oil catch tank and other hoses etc. 13) Fit red top bosch injectors. And erm I've forgotten but I think that's it-ish....it's easy, just take your time and you'll be fine. I would fit the chip first and turn the engine over. If it doesn't fire, abandon the project and contact NSRacing. Toothed pulleys & belts for the Vortech anyone? Does anybody have a VGi with a VF kit? If you guys don't already know...the VF inlet pipe WILL NOT fit the VGi without modifications. The people responsible for my expensive hobby! With all this grunt going through the front wheels these days, a front turret brace is a wise investment. It stops the turrets pulling apart when deploying big torque. You only need an upper one. Lower braces are only useful for extreme decked cars and ULTRA grunt. I like this Eurosport one. Fits super and turboed engines a treat and doesn't foul anything. A typical Stage 2 VF dyno plot. One of my early ones. I think this was with the original GIAC chip, which as you can see, is some way off the advertised numbers! !